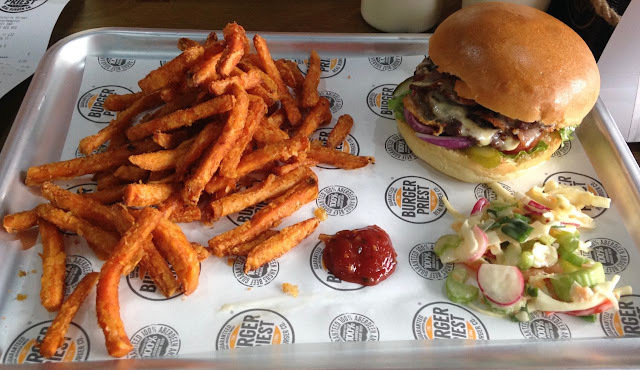 It was really nice to hear of a new burger bar opening in Wolverhampton. The city is going through a lot of changes at the minute, it is being heavily invested in and although this means there are plenty of works and potential going on, it also means there hasn’t been much new opening up recently. 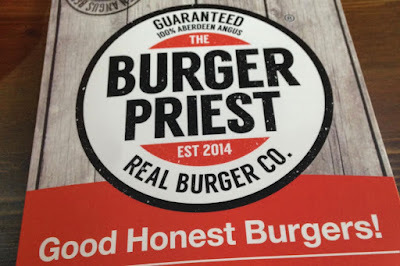 I think we are starting to see the beginning of the changes, there are plenty of things promised, like new department stores, but The Burger Priest is one of the first new restaurants to open in a while. 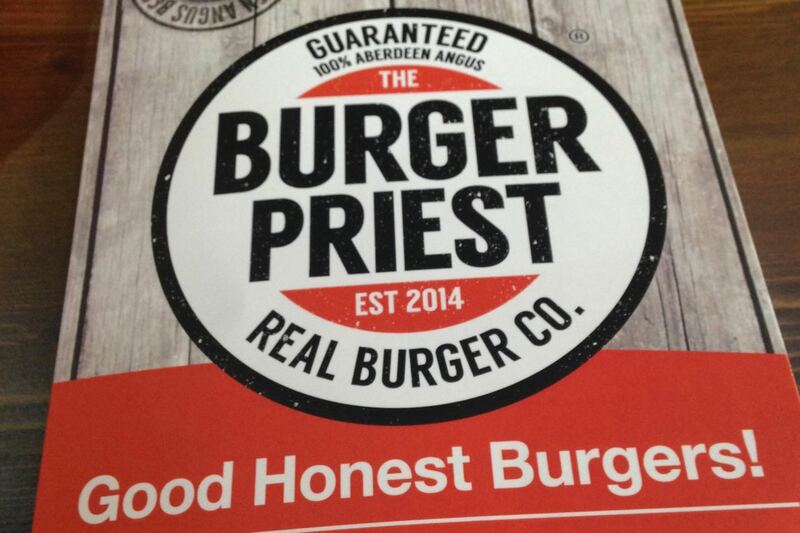 The Burger Priest is fast food burger bar, but it is still very smartly themed, mostly in a pseudo religious way. For example they don’t have opening times they have Worship Hours (11am-10pm), and many of the seats are styled on church pews. Its very smart inside and I liked the attention to detail on the theming. The openings times also mean if you are planning a theatre trip to Wolverhampton Grand it is perfect for a pre-theatre meal. 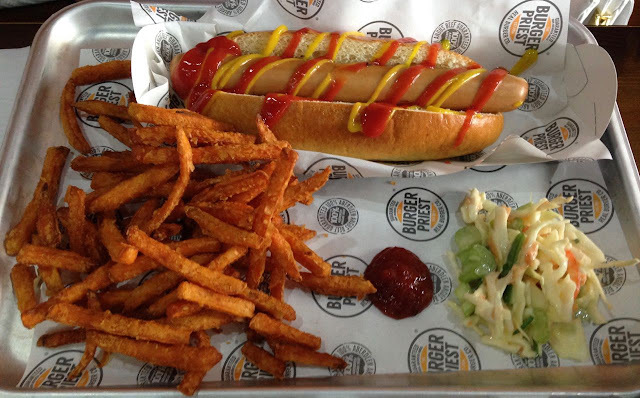 The menu is very comprehensive and we chose a Vatican Burger (with cheese and bacon) and a Classic American Dog. You have to order chips and sides separately, but I was over the moon to see sweet potato fries on the menu. 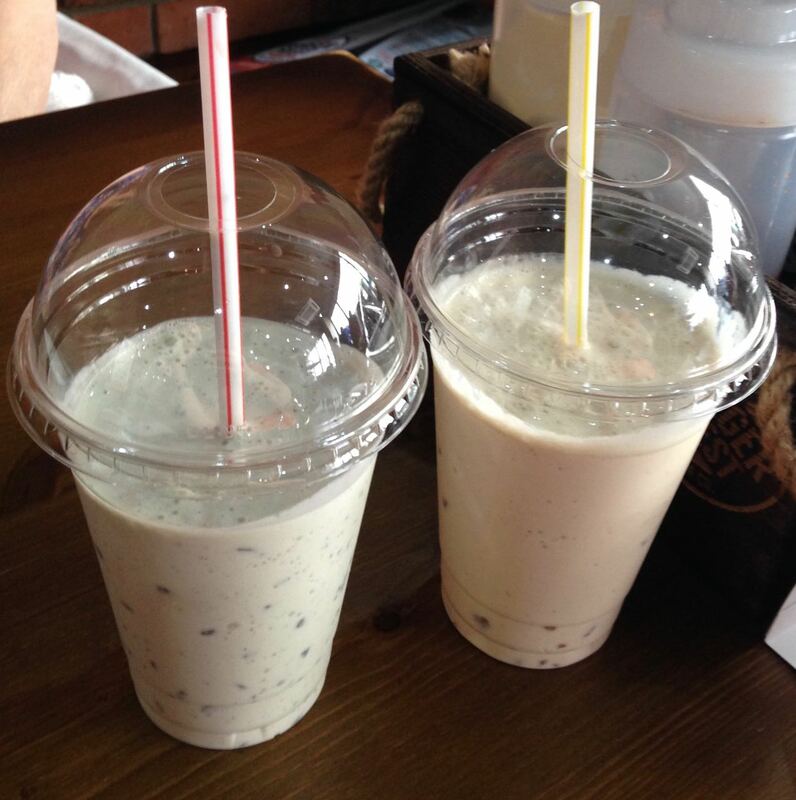 As we were in a themed burger bar, it felt appropriate to have milk shakes, we ordered a Salted Caramel shake and a Mint Choc one too. Unlike most burger places The Burger Priest is licensed and has a number of beers available, and of course soft drinks too. The drinks came over very quickly and we gave them a taste test, both were lovely and thick and made properly with ice cream. The mint one had chocolate chips in it and was very refreshing, the salted caramel was lovely and creamy and had caramel bits for texture. The food came shortly afterwards, and were laid out on trays, with the fries, some burger relish and a little coleslaw on the side. I chose the regular sized portion of sweet potato fries and had more than I could eat, I tried folks, I really did! They were beautiful by the way, crisp on the outside and fluffy inside, so cooked perfectly. They are absolute heaven dipped in mayo, you should try it. My burger was superb. The beef was very meaty and had a lovely smokey hint to it, like it had been barbecued. The juicy burger and crispy bacon worked like a dream. The brioche bap was a lovely addition too, with its light buttery flavour. The food here was good, seriously good. Like wise the hot dog had a slightly smokey flavour and was thick and juicy, a classic done really well. We went the first Saturday they were open, and I lost track of the number of staff who asked if we were okay or needed anything else. I was impressed by how fast the food came too, given how busy they were. The staff are clearly very attentive and seemed to genuinely care that we were enjoying our food and wanted to know what we thought of the place. Well let me tell you the burgers and food here are fantastic, the church theme keeps it fun and the service was very quick and friendly so we can’t wait to go back and explore the menu further. It ticked all the boxes and I'm converted. Two meals and two large shake came to £25.